When my oldest two children were my only children, we rode the bus frequently. We have a very convenient and relatively frequent bus that takes us right to the Kirkland Library, and before we had our cargo bike, that was our favorite way to go. The kids, because they love the bus, and me, because I didn’t have to grumble about parking (that, my friends, is freedom). The older could walk on her own, and the younger went in a baby carrier or walked. I carried the diaper bag and library books. I don’t remember it going anything but smoothly. Yeah, sometimes we had to wait, or we missed a bus, but there was nothing memorably terrible. Getting on and off the bus was always a little stressful. It’s hard for little kids to get up and down the steps and I was always afraid of leaving somebody behind. Once we had twins, we quit riding the bus because I couldn’t figure out the logistics of it. I’d heard that you couldn’t take a stroller onto a King County Metro bus without folding it and I just couldn’t see how I could get two babies, a stroller, the diaper bag and library books, and two other children on and off the bus in a timely manner. So we drove everywhere that we couldn’t walk to until we got the cargo bike at 10 months. When they were about a year and a half we experimented with the bus. I tandem wore them and we brought along a rolling suitcase with the gear. It.. worked, I guess. But a bus trip tandem wearing toddlers is exhausting so we only did it a couple of times. Last spring I heard that Metro changed their stroller policy (thanks to a fellow Mom of twins!) to allow a child to stay seated in the stroller. Great news! But I was still nervous because I’d never done it and never seen it done, and had heard horror stories of operators still telling caregivers to fold up the stroller. Plus, the wheelchair lift has always seemed a little sketchy to me. But then we got a bunch of new fancy low-floor kneeling buses on our route, and it started to look a little more possible. And our bus is never full. And then we added a weekly trip to Crossroads to our life. We can get to Crossroads on the bike, but it’s at the edge of our bike-shed, and our bus also goes there. Hmmmm. Two weeks ago I packed everybody up, one baby on my back and one in the single jogging stroller (big, but with a better brake and much nicer for long-distance pushing than the umbrella stroller). The 7yo carried a backpack with her school books, and the diaper bag and library books (because there’s a library at Crossroads too) went in the basket under the stroller and we dashed out the door to catch the bus. Then I saw the construction going on at our crossing. It’s for a new flashing crosswalk, but does make the current crossing even more questionable. But with all of the cones and equipment around, drivers were being very careful so we had no issues walking down the middle of the street and then waltzing across the arterial while the drivers yielded to us for once. Maybe we can keep the concrete mixer there permanently? When the bus pulled up, the driver went back to get the wheelchair area ready for us, then knelt the bus and I wheeled the stroller straight on. It’s a little tight turning the stroller around with a baby on one’s back, but we did it and when I admitted that I’d never done this before, the driver strapped the stroller into place with the wheelchair straps and we were on our way. I sat where the toddler in the stroller could see me, and held the other toddler on my lap. I put him back on my back before we got off the bus. On the way back, I had to do it all myself. The stroller easily rolls onto a un-knelt bus just fine and I found the handle to lift up the seats in the wheelchair area. I turned the stroller around, and as soon as I’d positioned the stroller and set the brake, the bus started moving. I couldn’t figure out how to pull out the wheelchair straps, so I sat in the seat behind it and held on to the handle. This time I put the second toddler in a seat next to his older brother, and when we got home, he was able to get himself off the bus, thanks to the low floor. Now that we’ve done it once, I’m sure we’ll do it again. The kids all love the bus. It looks like there can be a range of operator responses to a stroller, but while the second driver was completely unhelpful, he was certainly friendly and not hostile to the stroller. After my finger injury I didn’t drive for two weeks or bike for three. Between that and having lots of family around for Christmas I have many many thoughts about how we make transportation decisions. One of my favorite things about biking errands last year was biking for Christmas shopping. This year I couldn’t bike and didn’t want to park at the mall, so I put off Christmas shopping until three days before, and parking at the mall stunk just as much as I thought it would. I was so glad to be back to biking by the time Christmas Eve rolled around. Our 7-year-old was singing with the Children’s Choir at the Vigil Mass, and I wanted nothing to do with the zoo that is parking for Christmas. Attendance at the Vigil is about double that of a usual Sunday Mass, and those are already full! So we biked, even though it was raining, and our usual policy is not to bike if it’s raining on the way to Mass. Turns out rain pants fit fine over a dress, as long as the dress isn’t too long. With my finger injury I’ve had some solo medical appointments, and I’m so thankful to six-months-ago me that our new doctor is the one that’s an easy bus ride away. A solo bus ride is remarkably easy, even when one is not totally well. I was able to get myself to my appointment while Mark took the kids to class. Medical facilities may not be great foot-traffic generators, but it’s vitally important that they be accessible to those who cannot drive, for whatever reason. It’s also vitally important that medical establishments offer bike parking and give transit directions on their websites. That said, with more than one person, there’s no good reason not to drive to Kirkland. There’s a wonderful new fabric store (seriously, it’s like the craft blog world come alive) in the same building as our doctor, and for a shopping trip with my mom and sister on a Saturday morning, we took the car, even though the bus is about as convenient as it can get. With a half-hourly bus and free parking, why not drive? Then we took some family to downtown Seattle to go to the Aquarium and Pike Place Market. Five round trip bus tickets, driving to the park & ride, half-hourly bus, vs. tolls and parking, but a direct route home (and then we got lost getting to the freeway…). We never made it out to look at the neighborhood lights, but the dark bike rides home from class at 5:30 were plenty enjoyable. Viewing lights from a bike is much nicer than peering through a car window, even if the car is warmer. The comments we get about biking in the winter are usually along the lines of “you sure are bundled up well for biking in the cold” or “good for you for biking in this weather.” Biking to church is about a ten-minute ride. 1. You could bike that naked and be fine in our climate. 2. The car doesn’t warm up in the time it takes to get to church, so we can sit there and shiver or keep warm pedaling. We have about the perfect climate for year-round cycling – it rarely gets that hot, it rarely gets cold, it rarely snows, and it rarely rains more than a drizzle. It’s often grey and chilly this time of year, and there aren’t that many hours of daylight, so getting fresh air and natural light can be tricky in the winter when nobody actually wants to go outside. If we get a bike ride in, I feel fine holing up the rest of the day inside where it’s warm and dry and there are Legos and train tracks. Happy New Year to all of you! Thanks for joining us! Here are some brief notes from the transit update at the Kirkland City Council meeting on 11/4. It covered ST3 with a focus on the CKC. I mostly wrote them so I hopefully wouldn’t have to watch the video again. I’ll make my comments obvious. We (and Michelle in particular) have been thinking a lot about the tradeoffs with transit on the CKC. In particular, what are those tradeoffs and what other tradeoffs might we make instead? We strongly disagree with the idea that BRT on 405 is sufficient for Kirkland. Why transit on the CKC? ST assumes middle of corridor, which would severly impact the CKC. Kirkland is lobbying strongly against this. In short: a 20″ bike works just fine on a King County Metro bus. When I was out with my daughter last weekend, we let the bus carry us and our bikes back up the hill to our house. I’d heard that a 20″ kids bike would fit on a metro rack just fine, but you never really know until you do it yourself, right? We got on the 245 at the beginning of its route in downtown Kirkland. I know that the bus waits there for a while before starting the route, so we’d have plenty of time to get the bikes loaded. Easy-peasy. I don’t know why I even doubted it! On a bike with fenders, the clamp grabs the fender, and not the wheel, but that’s enough to hold it securely. There was a huge amount of backlash (and here) at the Washington State Traffic Commission meeting to set tolls on the I-405 HOV lanes. Unfortunately it seems like most of the conversation skips over the actual purpose of these lanes: a reliable transportation option. Before going into that, it seems quite reasonable to question whether or not additional lanes should even be built. There’s a pretty strong case to be made that any increased road infrastructure simply feeds more sprawl. The infrastructure to support this sprawl isn’t sustainable, so at the least we had better stop making things worse. But I’ll ignore that today because the road is already being built. Related, of course, to whether or not we should build something is its direct cost (ignoring the future maintenance and potential sprawl costs) and how we would pay for it. We’ve long accepted that we’ll use general funding to support things for the public good. It will come as no surprise that this blog supports public investment in pedestrian, bicycle, and transit infrastructure. And while we’re not happy with the amounts and types of investments made for car travel, perhaps it is going too far to demand that tolls fully fund a project like this. Or more importantly, we need to remember the other reasons for the new lanes and a toll. Last week was a good week not to have a bike. Last week it rained, really rained. Most of the time in the winter here it’s not too hard to go outside because even if it’s raining you don’t get all that wet. But last week it was really raining, and I was thinking that I was so glad not to have to go out in it. I considered taking the kids somewhere by car, but then realized that I didn’t want to go out in the rain in the car either! Not only did I not want to drive in it, but once we got to where we were going, we’d still have to walk in it from the parking lot. At least with the bike we are dressed for the weather wherever we go. So we mostly holed up at home and watched the rain and played with finger paint and the lentil bin. Hooray for homeschooling! 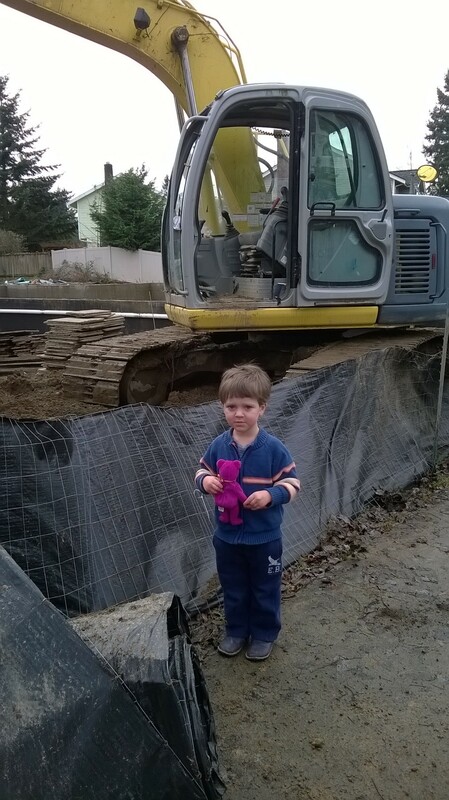 For the most part, the farthest we got was the construction site down the street. This week we’ve had the stomach flu. Also a good time not to have a bike, since we weren’t going anywhere anyway. Wednesday evening I was grumbling to myself as I was walking back from the store carrying a baby and pulling a grocery cart, exhausted after having been up all night with sick kids and cleaning up all day and not feeling so well myself (turns out I was just hungry), but then I realized that even a car was not a magic device that would make my life easier at that moment. I was thankful that we were so close to the store, making that errand much faster and simpler than it could have been. Yesterday, everybody feeling much better, I had some errands to do in downtown Kirkland, and was able to do them all alone. I’d normally take the big bike, since there’s enough of a hill that it’s nice to have a motor coming home, even if the only cargo is myself. But we also have a bus that’s about as convenient as a bus can be, so I found my ORCA card and went. I haven’t yet figured out the logistics for four kids on the bus, so I’ve hardly ridden the bus recently. The bus was a great mode for this trip. If I’d driven, I would have parked in the library garage, which is right next to the bus stop I used. I might have walked to City Hall anyway, but I would have been tempted to drive because City Hall is just far enough to want to. If I had driven between them, I would have grumbled about the driving instead of walking. Instead, I had a nice walk, and found a new-to-me bakery and a marionberry croissant. I sat on a bench outside in the almost-sun, picked up our library books, admired the Pump-to-Gram at the bus stop, and then rode home.